Huge congratulations to Lauren and Chris who celebrated their marriage at the beautiful Old Brook Barn, Navestock, Essex. They worked really hard getting the barn ready and made such a fab job of it, they even made the floral centre pieces themselves. I think most of the family on both sides mucked in so it really was a joint effort! 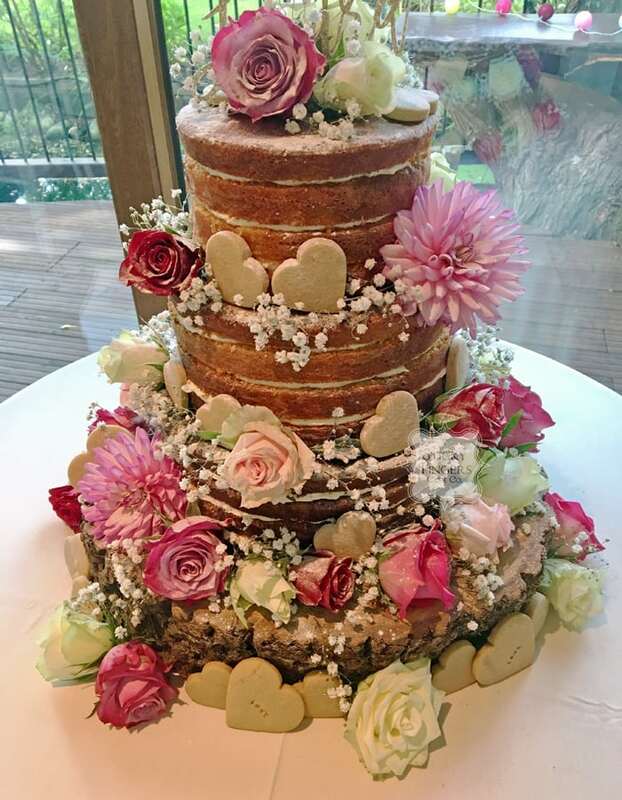 Luckily they left the cake to me and chose to have a 3 tier naked wedding cake, decorated with fresh flowers which were provided by their florist, and also cute heart shaped vanilla cookies which were being served alongside the scrummy cake later. Amazing flavours of salted caramel for the bottom tier, followed by Madagascan vanilla and raspberry for the middle tier and finally lovely lemony lemon cake for the top tier. I hope you had a truly wonderful day and wish you a lifetime of happiness!